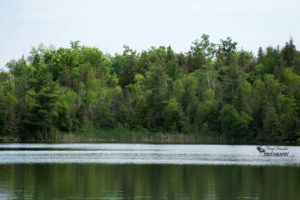 Crawford Lake Conservation Area is located in Milton, Ontario off of Conservation Road. It features a reconstructed 15th century Iroquoian village based on archaeological findings of 11 longhouses and over 10,00 artifacts from the native people who resided there over 600 years ago. 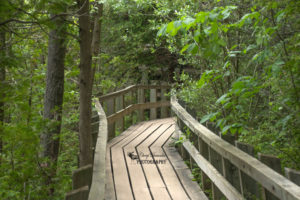 Visitors can also enjoy the many hiking trails including the Hide & Seek Trail which displays wooden carvings of species at risk and the Nassagaweya Canyon Trail which connects the conservation area with Rattlesnake Point. 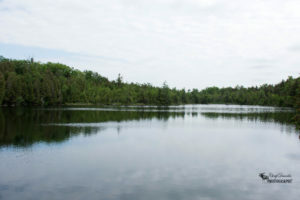 At the very centre of the park is Crawford Lake – it is surrounded by boardwalks providing visitors with a means of enjoying the beauty of the area. Since the primary focus of my trip to Crawford Lake was to hike and take photographs I did not visit the village but rather began my day at the visitor centre where the access point for the trails was located. I started out on the Woodland Trail but instead of looping around I continued further on to the Pine Ridge Trail following it until it reconnected with the Woodland Trail. Unfortunately due to the growth of the grasses and such the condition of the trail wasn’t great and the amount of insects constantly around me made the trip very unpleasant. 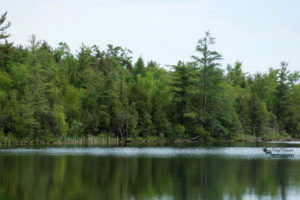 Once I had finished the rest of the Woodland Trail I finally reached the Crawford Lake Trail which is where I finally encountered my first glimpse of wildlife. 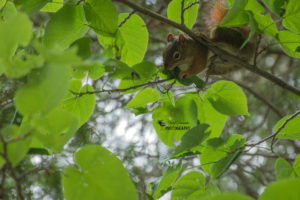 A red squirrel was up in the tree branches above my head eating something allowing me to take a quick photo of it before it scurried off. 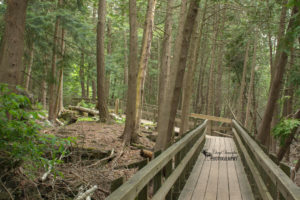 The boardwalk trail was definitely the highlight of my visit and was a very pleasant walk through the forest with many lookout points of the lake. I reached the end of the boardwalk where there was an open gravel area providing the best view of the entire lake so I found a rock to sit on and took in the beautiful sight in front of me. 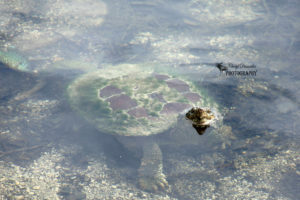 As I was taking some photos of the lake I noticed something swimming in the water which at first I thought was a large fish but when it got a bit closer I realized it was a turtle. It began to swim over to where I was sitting on the rocks so I got my camera ready in case it surfaced. I guess it was reading my mind because it pulled itself onto some rocks right in front of me in the water and peaked its head out just long enough for me to get a fantastic photo. At that point in the day it was getting late so I decided to find my way out of the park back to the visitor centre. 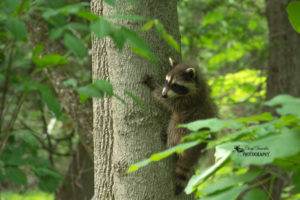 While I was walking down the trail I saw a raccoon on the edge of a fallen tree and then it disappeared back into the forest where I could hear the sounds of babies. Sure enough mama raccoon was getting her little ones ready to venture out for the evening so I waited for a few moments hoping to catch them on camera. After a few minutes had passed I finally saw mama emerge on the trail with her babies not far behind her. I was only able to get one decent photo of a baby climbing a tree before I lost sight of them on the other side of the trail. After ensuring that the family of raccoons were safely on their way I continued on down the trail reaching the visitor centre and the parking lot where my car was located. 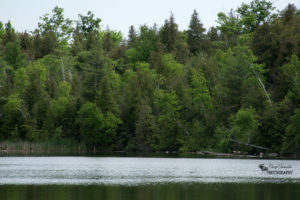 Below are the photos taken during my visit to Crawford Lake Conservation Area. Please enjoy them and feel free to comment, like or share this post. 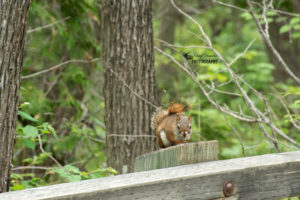 This entry was posted in Conservation Area, Hiking Trails, Nature Photography, Wildlife Photography and tagged animal, Camera, conservation area, Crawford Lake Conservation Area, hike, hiking, Lake Crawford, Milton, nature, nature photography, Nikon, Nikon D7200, ontario, outdoors, outside, Photo, Photography, Raccoon, squirrel, trail, trails, turtle, water, wildlife, wildlife photography.